Six days and counting until Rascal starts school! As for me, well I'm caught in a haze of preparations... The birthday, the party, the school visits, life is anything but boring at the moment! Regardless of all this busyness, I couldn't help but start a new wee project. On Rascal's school stationery list was a "large waterproof, velcro closing book bag". I saw the ones that they had available online and in the shops and yawned! Surely I could make something a bit more fun! 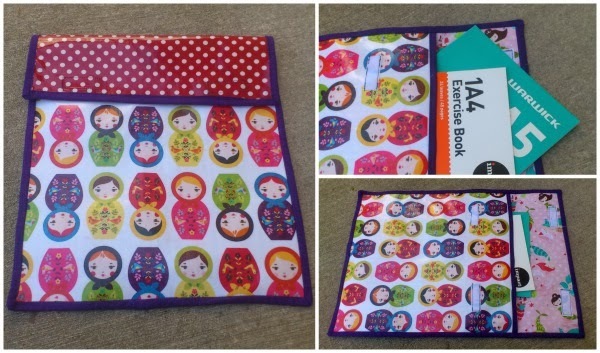 I made up the pattern as I went along and with the exception of a few wee dodgy spots on the machine sewn binding (which I will notice but nobody else will), I'm really really pleased with the finished result. So pretty. A great idea. Better then buying one. I would love a tutorial, so I can make one. So cute! I made E's one too, but not as cool as yours! I've got another one to make soon too. Looks great, Juliet! I have yet to sew with laminated fabric. A tutorial would be great. A very cute book bag! Fantastic! I still remember those fluro book bags from my primary days! I hope she LOVES her first week of school!!! All the best!